Groups such as classes, sports teams and other school organization. Our main market is High Schools, Middle Schools and Junior Colleges...anyone who needs to regularly raise funds. Pros: The software was really easy to use, some organizations have tried to go with other similar sites which many of them have the same features. What really separates them from the rest is what you get back. Other Companies charge so much more then FanAngel for nothing. Rep was awesome to deal with, he really takes pride in his product and is always there to answer any questions that you may have. Cons: Honestly, I really didn't have any cons while dealing with this program but if anything right at the end trying to figure out how to transfer money from the FanAngel account to my banking account was a little confusing and took a little longer but i'm not sure if this was a FanAngel issue or the third party used. Overall: My overall experiance was awesome, from start to finish owner was right there with me walking me through everything that I needed to know. It was safe, simple, and effective we raised close to $5,000 for my team and all the money/donations/ were right there visible to see who was raising what and where it was coming from. Thanks Justin. The firecrackers did amazing. And you lead the way as I recall! Just shows what a team can do with great leadership. Fan Angel- The easiest fundraiser with the greatest return! Pros: I loved the convenience of this fundraiser. Our page was set up by the customer representative. All we had to do was answer a few questions and within a day he had everything up and ready to go. I could go in and make changes if I wished, and the software was very easy to navigate. Cons: I honestly can't find anything I didn't like about this program. The website was easy to navigate, and everything was well placed on the page. The social media integration was also fantastic. Thanks Justin! You were our very first Choir Program. You and Julie were awesome. Your video tells volumes about your program. It's clear why your choir has so much support. Pros: The greatest advantage is the percentage of funds that we were able to keep and the ease of use. My rep was awesome. She was always there to answer questions or returned phone calls in a timely manner. She understood the busy schedule of a head coach and helped at every turn. Super easy to set up a team. Cons: The only hiccup we ran into was when people wanted to create an account after the campaign already launched. It was easily solved by my rep with a phone call in about 5 minutes. Overall: Trying to raise money and coach can be a challenge. I am so grateful that I found FanAngel. I looked into other options and am glad I chose FanAngel. Thanks Rick for the great review! I'm so glad you found us, too! All of our reps are coaches or booster parents, so we get it and want to give you the support you deserve. Have a great season! Pros: The fundraiser campaign was extremely easy to set up and launch. The customer rep was very helpful and made the experience seamless. Simple and extremely helpful video tutorials to help get started. The reps customized the campaign webpage without us lifting a finger. It was very easy to follow the progress and know exactly which players did their part and how much they raised. 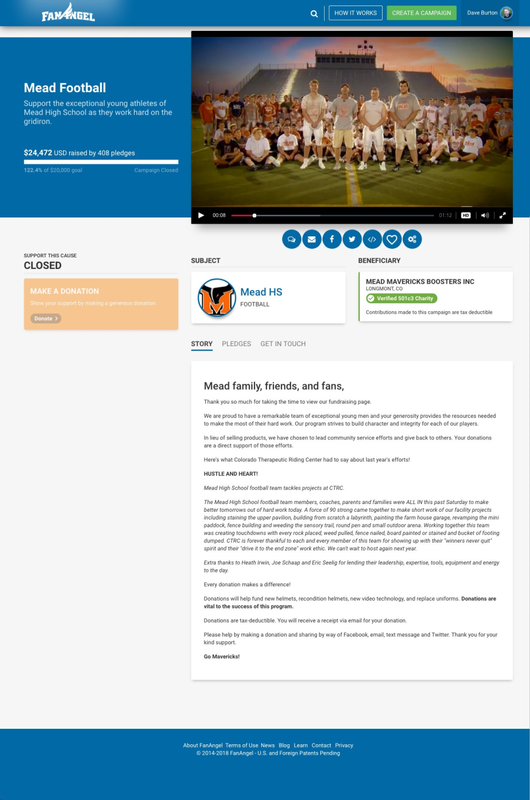 The funds were directed into the school account without a hitch. Cons: I have no criticism of the software at all. It is a great product. Overall: We were able to reach our goal of $10,000 in a month-long campaign. FanAngel's fee of 7% allowed us to keep much more of the funds that we raised, compared to the 20% fee of a competitor platform that we used last year. I highly recommend FanAngel. Hey Coach Nixon! Thanks so much for the kind words. The team did a great job all around! We are so pleased we were able to help NCS Baseball. Best of luck with the rest of your season! Pros: It was very easy to use. Fast & Friendly support. Cons: Nothing, it was very easy to use. I highly recommend them. Overall: This was extremely easy to use and ended up having our best results as a program ever for fundraising. Cons: I like everything about this software! No issues with it. Overall: I really enjoyed using Fan Angel! Great product and got the job done. No issues at all with using this product. Customer support was great and timely. User-friendly and a very well put together product. Thank Coach Byrd. The boys really got after it! Great participation is what these fundraisers are all about..and Plano East delivered. Easy! Great service and value! Pros: You keep a very high percentage of your profits! A much higher percentage than other crowd funding services. Cons: We had very little setup. The only way it could be better would be no set up, and I don't think that is possible. Overall: The funds we have raised have helped our members cover their participation costs and given a cushion as we start our season. Pros: Overall quality, ease of use, features and functionality, and support team was timely in answering my questions. Cons: Program responsible for video, pictures, etc. Overall: Professional with the highest percentage given back to program/sport. Thanks Gary! Glad we were able to get this launched so late in the season. You rallied the girls and they got it to done! Great job. Pros: It's easy to use, fun to watch your fundraising progress. Cons: People were a little confused about using it despite clear explanations. Overall: Great. We reached our goal and felt supported by FanAngel. Thanks Lynne. It was a pleasure working with you. Fundraise is a team effort and your hard work is what made it a success!